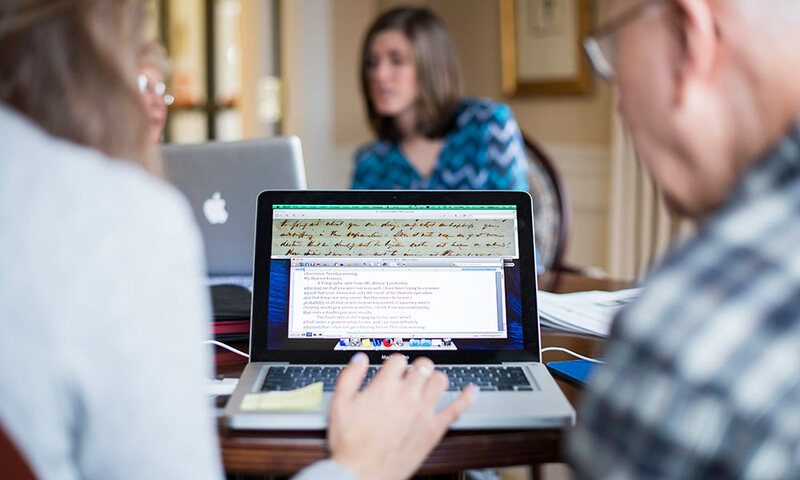 The Seward Family Archive, a digital humanities project that’s a collaboration between the Department of History and the River Campus Libraries, has been awarded a two-year grant totaling over $97,000 from the National Archives Literacy and Engagement with Historical Records Program. Thomas Slaughter, the Arthur R. Miller Professor of History and director of the project, said the grant would be used to continue and expand the collaboration with volunteers from the Highlands at Pittsford retirement community and retired University staff and librarians, and to implement the collaboration as a model for community-engaged teaching and learning. The students and volunteers began their partnership this past academic year and work to transcribe, annotate, and tag personal letters of President Abraham Lincoln’s Secretary of State William H. Seward, his wife, Frances Miller Seward, their family, and friends from about 1820 to 1873. The funding will support a graduate student to manage the collaboration and up to six undergraduate editors each year. In addition to the National Archives grant, the Friends of the University Libraries has provided a $3,000 gift that is being used this summer to support the work of an undergraduate transcriber and annotator and a graduate student editor of letters between Seward family members and the radical abolitionist Senator Charles Sumner of Massachusetts. For more information on the Seward Family Archives Project, see this story or visit the Sewardproject.org.